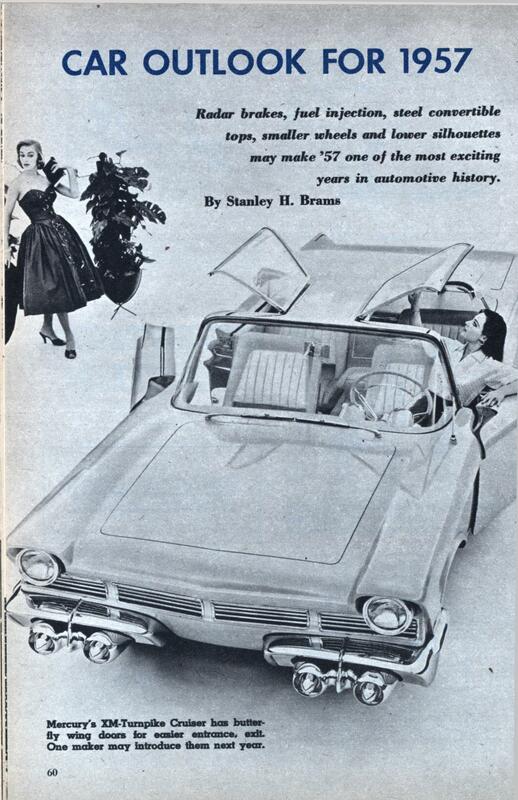 Radar brakes, fuel injection, steel convertible tops, smaller wheels and lower silhouettes may make ’57 one of the most exciting years in automotive history. WHEN you slide behind the wheel of your 1957 car, the look from the driver’s seat to the road (or from the road, looking at the car) will be quite different. And the way this model threads through traffic or responds on the highway will be pleasantly improved—as will the way it stops. In short, 1957 cars promise advances and styling changes that haven’t been possible up to now. Some of the improvements planned may not be ready but enough will come to make next year highly stimulating. One of the most remarkable improvements in the works is the radar brake which might well be the first step toward completely automatic car operation. The radar brake will be directed by a screen mounted in front of your grille, small enough so that it will hardly be noticeable. From the screen will be transmitted bounce-back detection beams, just like wartime radar. Whenever the beams hit an obstacle ahead they’ll message back to the brake system. The brakes will automatically take hold through a system of solenoids, reducing car speed even if the driver is unaware of what’s ahead. An adjustable “bounce” is hooked up with car speed so the safety factor will be as worthwhile at top highway speed, with greater distances between cars, as it is at relatively modest speeds where you are apt to crowd closer to the car in front. Of course the beam can be cut off entirely for city driving so you won’t be stopping and starting in continuous jerks. Next year you will see a significant step in casing evolution. Wheels and tires will be smaller on many cars. Four-teen-inch casings will make a bow, not only a full inch narrower in diameter than the standard tires of recent years but tires that will need inflating only to about 20 lbs. or so. The result will be an easier, softer ride, lowered silhouette, modestly faster acceleration and slightly less top speed. In addition to radar brakes, there promises to be some other notable change in braking systems—a subject of concentrated study in the past decade when speeds and power have been increasing and brake development has lagged behind. Reports are that 1957 will see disc brakes on more production cars. The virtue of these brakes is that more surface is provided than is possible with today’s conventional cylindrical shoes. A circle of metal revolves with the wheel and pressure is applied against it by movable pads. Friction is spread over a larger area and cooling is somewhat improved. Above the wheels will be new body shells that will be lower and, hence, look longer than ever before. Part of the new lowness will derive from the smaller tires and wheels, although a widened cross-section on the tires will eat up part of the one-inch savings in height that would otherwise be realized. Some more of it will come about in a natural, evolutionary sort of way with both floors and rooflines lowered so that passengers can sit closer to the ground without any sacrifice in headroom. In order to maintain an unchanged amount of entrance room, and possibly to increase it, doors may reach farther upward. Some are likely to intrude a bit into the roof. One producer, at least, is thinking intently about introducing a so-called “butterfly wing” top to make entrance easier. This would follow the designing of some dream cars shown earlier this year. As the door opened a segment of the roof immediately above it Would raise gently, like a wing, making it possible to move into the seat almost as you enter a convertible with the top down. Plans also call for a hardtop model whose entire roof (or most of it) will slide back into the rear deck, like an orthodox convertible. In a more general sense, next year will likely see continuation of two approaches toward design, both of them considerably refined. One might be called the General Motors school of styling, with squarish hoods and rear decks. The other has been followed by Ford and Chrysler stylists and is characterized by a line rounding downward, particularly along the hood. Both schools of design, however, seem bidding to go curvy on the sides. There is expected to be seen a gentle arc, wheel line to roof line, resulting in more ample hip room on the seats and in the better handling that derives from a widened structure. That arc, too, will mean the introduction of subtly curved side glass. More glass everywhere. That will be a hallmark of the 1957 models as it has been for a steady number of years. The glassmakers are hard at work providing not only larger and more intricately rounded panes but also stronger ones. Sun-filtering tinted glass will be standard on a number of makes. The bright metal trim on your 1957 will stand up better than in past years. The reason is in the metallurgy of the material. More and more stainless steel is being used and will be used. Inside those cars of 1957 will be many innovations. First off, the upholstery. Synthetics that are again brand-new will come into sight for fabrics, and they will be more practical than in the past. Their designs will tend to obscure dirt and they will clean up more readily. Once again they will be brighter and more lively, in line with the trend toward happier colors and combinations on the outside. Individual seat swiveling, something inevitable some day, may turn up. Front passengers may be able to swing their seats at least 45 degrees outward to make entrance and departure easier. And you’ll see more cars next year with reversible seat cushions. Dashboards will be largely padded (there was substantial movement that way in 1956) and finished in colors to match the rest of the interior. Controls will be more inconspicuous than before. With these bows in the direction of safety, another innovation may appear—redesigned steering wheels, some like the “deep dish” idea stressed so strongly last fall. That steering wheel, incidentally, will be changed in another particular. The tendency will be to reduce the number of turns from lock to lock, particularly among the larger cars, so you won’t have to do as much Work swinging around a corner. That kind of reduction is possible because of the growing use of power steering, all but standard on the higher priced cars. That power option brings up others. The day is fast approaching when automatic transmissions will be standard equipment rather than available on order. The 1956 model year saw many lines install automatic drives as regular equipment and this drift will broaden for 1957. Air conditioning, if you’re interested, will once more be lower in price. It is steadily pointing toward the day when it will become standard equipment on most cars, and when those cars will be sealed units without movable windows, providing man-made temperatures and drafts as desired. More windows will be power-operated in 1957. Visualizing the console of buttons to control the windows brings up the anticipation of another dash at the driver’s side containing buttons that will lock and unlock the doors on the right-hand side of the automobile. The change that no one will be able to see on the 1957 cars, but the one that may mean more than nearly any of the others, is a far-reaching modification under the hood. Detroit expects that one maker, maybe more, will use fuel injection on 1957’s rather than an orthodox carburetor. For the great majority of car buyers, fuel injection, although not new, will be something unfamiliar. The carburetor is eliminated and a series of nozzles set up, one for each cylinder. For each of these nozzles, a system of mixing air and gas and feeding it directly to the firing chamber is used. You then have fuel injection. Provided the separate nozzles are properly adjusted, engine performance is perfectly even, cylinder to cylinder, and ideally economical. The engine runs smoother than it possibly could any other way and it burns the minimum amount of fuel. It’s more silent and tends to vibrate less. That is the mechanical virtue of a fuel injection system. But there’s another of equal importance to the car-makers who consider mechanics in relation to styling. Fuel injection—and it is all but finally specified for at least one 1957 automobile—can make possible some really remarkable changes in design. The reason is the carburetor—or the lack of a carburetor. Each carburetor, as you know, has to have an air cleaner attached so the air fed to the mixing chamber contains no dirt or particles that will clog Up the tiny passages of the carburetor. The bulkiness of the air cleaner is the reason hoods are as high as they have been. With carburetor and cleaner eliminated, it’s possible to lower the hood. And it will be lowered. That’s the big- gest styling development expected to come out in the 1957 models. Cars with fuel injection can confidently be expected to have hoods as much as six inches lower. To cope with problems created by lowering of the entire automobile, suspension systems may well undergo modification. There’s industry talk of independent suspension at all four wheels rather than on the two front wheels only. Some think that this individual suspension will come about by use of air bellows, like those announced by one truck producer a few years ago, in conjunction with more orthodox springing mechanisms. Others, however, think the air suspension for passenger car is definitely longer than a year away. It has been reported that Plymouth, Dodge, DeSoto, Chrysler and Imperial autos for ’57 will be equipped with torsion bar suspension on the front end, replacing the present coil springs. Chrysler is reportedly making its own torsion bars and is tooling up now for production. Packard was the first car-maker to introduce this type spring on its ’55 models. Aside from the fuel injection system (and that only on one or maybe two models) the single change of note for 1957 under the hood will be, again, more compression. The air in the firing chambers will be squeezed more tightly than ever before, just as it has been in recent years to keep pace with better gasolines. The result will be still more exciting performance and more horsepower, amplified still another notch with the use of fuel injection. You’ve read over and over again about gas turbine engines and how they may replace today’s spark-fired motors. Gas turbines will come, to be sure, and with them may come the use of diesel engines in passenger cars. Chrysler Corp. already has a diesel-powered Plymouth Belvedere four-door sedan in production in Belgium. Its four-cylinder mill is rated at 40 hp. You probably won’t see any production gas turbines or diesels on American roads next year, but the changes you will see are startling enough to mark 1957 as one of the most exciting years in automotive history. @Don – You want a flying car? Drive over a speed bump at 100 mph! Don, here it is and you can buy it cheap. 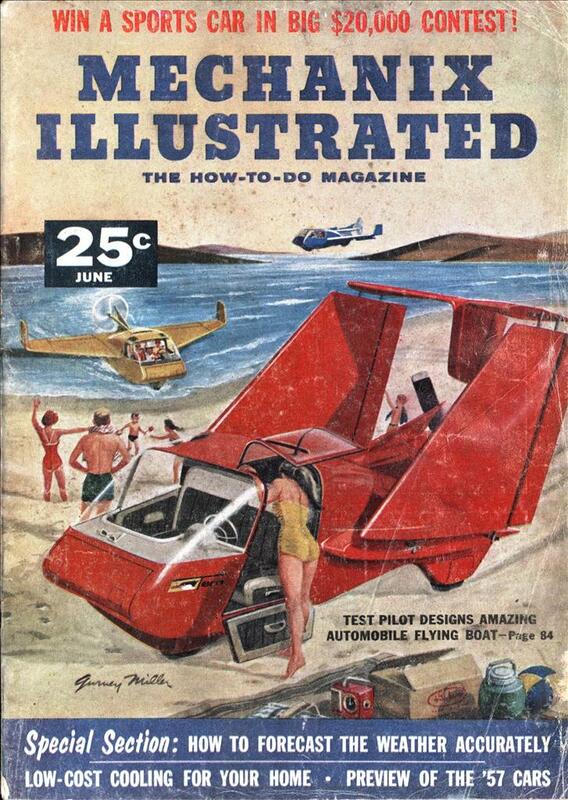 Seriously, the flying car and jet pack jokes are getting pretty old. Both have been developed and offered for sale, just no one really wanted them. Fuel injection and automatic transmissions were definitely on their way in for the 1957 season. Ultra-glamorous gowns like the one modelled top left on the front page, however, were on their way out. So sad. Fuel injection and radar assisted braking in 1957. Too bad the electronics of the day where not up to the task. The fuel injection worked but it was expensive and when it broke it took an expert to fix. Carbs where cheap and good enough. The radar assisted brakes are now available on high end cars. So it looks like the big 3 at one time really where on the ball. Too bad they didn’t stay that way. That radar braking system was a lot of fun too; because different objects have different radar returns as they move around, early tests of the Cadillac Cyclone in a city showed that it could lock onto pedestrians at a range of several blocks and slam the car to a stop to prevent a collision with them. One (probably exaggerated) story says it took several hours to go around a few city blocks in a series of abrupt stops and starts as the radar detected things and hit the brakes. But don’t be surprised if that ground beef you bought at the grocery store is fully cooked after you walk in front of one….as it slams to a halt and throws its driver through its windshield.